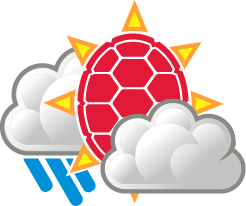 As syllabus week classes breeze by, many Terps are wishing the weather would do the same. Today’s intense sunshine and temperatures in the upper 90’s, with a heat index surpassing 105, begged for even the slightest breeze. Today’s heat advisory is in effect until 8pm tonight, so grab some ice cream and stay inside! Don’t expect any rain to break this heat wave tonight, because these clear skies are sticking around. However, temperatures will drop to 75 overnight and a southwest wind will blow at 3 to 5 mph, but at least it won’t be as muggy as Monday night! The east coast will see little relief from the heat tomorrow with a high temperature of 96 and a heat index again reaching 105 degrees. The wind will blow from the southwest at 3 to 7 mph, so whatever oven we are baking in must not be a convection oven. Slather on the sunscreen and slap on those sunglasses during tomorrow’s midday sun! A few clouds may come in tomorrow night as temperatures drop to 75 degrees, which will keep the crickets happily chirping all night! There is a 20% chance of rain, and winds will blow from the south at 6 mph.